A couple of months ago, I woke up around 1am - having uncharacteristically fallen asleep at around 11pm. Unable to sleep, I thought I would find a book to read and hopefully fall asleep a chapter or two into it. I went for Zukiswa Wanner's latest novel London Cape Town Joburg and next thing I knew it was 5:30 am, I was on page 334 and I was reading 'The End'. I knew from the title that London Cape Town Joburg was set in 3 cities and from the synopsis it sounded like it was about love and a relationship between the two main characters - Martin O'Malley and Germaine Spencer. I, however, wasn't expecting this when I began to read. Spoiler alert!!!! Lovely reader, please be aware that there is a spoiler coming up. As much as I try to never give away crucial plot points, it was difficult for me to write this review without including this. My first thought, 'Did I just read that?'. My second was 'How am I going to make it through this novel when there's already been a teen suicide?' My third was, 'Did I really just read that?'. Talk about an opening sentence, a sad one but definitely a memorable one. Having composed myself, I forged on and began reading this book which I ended up reading in one sitting. 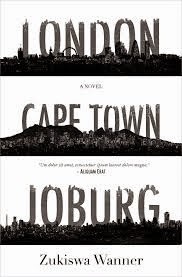 London Cape Town Joburg is told from both Martin and Germaine's perspectives, with young Zuko's thoughts coming in via his diary journal entries mid-way through the novel. It's also told in three parts: London (1994-1998), Cape Town (1998-2008) and Joburg (2008-2011). Yet to understand Zuko's suicide, we need to start at the beginning - 1994 in London. Martin O'Malley is a young black South African graduate of the London School of Economics - I will admit I had a soft spot for Martin when I read that as I am an LSE alum :) - working as an Investment Banker in the City who is still pretty stuck on his ex. Germaine Spencer is English, a lecturer at the Surrey Institute of Art & Design and a ceramicist trying to cheer up her best friend, Priya, whose boyfriend she caught cheating on her. Martin and Germaine first meet briefly when Priya dares Germaine 'ten quid to get a phone number from a man of her picking.' on a Friday. They meet again (by chance ) the next night at a club and completely hit it off, have brunch the next day and the rest is history. Yet, while this is a story of their love and their relationship - which spans 17 years - Zuko's death was constantly at the back of my head. Martin and Germaine's love may have begun in London, but their relationship, and also themselves as individuals truly blossomed in South Africa - first in Cape Town and then in Joburg. In the second and third parts of the book, we read about Martin and Germaine moving to South African and their own experiences and growth in post-apartheid South Africa, as well as their experiences being parents and wanting the best for their son. We also get to read their views of the exact same situations, which is something I really enjoyed reading. I also loved Martin and Germaine as a couple - their love (as idealistic as it was) seemed oddly enough believable and real. It reminded me a bit of Ethan Hawke and Julie Delpy's characters in the 'The Before' trilogy. Having never been to SA, I also particularly loved the stories setting in those two cities as it was a way for me to get a glimpse into the social, economic and political nature of those cities and how they differed. All that said, the highlight for me was Zuko and how Wanner chose to introduce him and his voice through the medium of a journal. If I'm honest, though, it would have been great if his voice came in earlier in the story. London Cape Town Joburg ends on an even sourer note than it began - if that is even possible, considering it begins with a teen suicide, but learning how and why Zuko commits suicide is sad and made me wonder how many other young boys experience such tragedy. The ending also left me curious as to where Germaine and Martin would go from there and how something so tragic would affect such a beautiful and true relationship. How do parents cope with the loss of a child, especially one who they lost through suicide? Yes, London Cape Town Joburg was about many things - race in post-apartheid South Africa, mixed race relationships, the role of art in women's empowerment, family, culture and so on, but what stood out the most for me was the relationships - not only between Germaine and Martin but with their respective families and the other people that were in their lives. This was a beautifully written story, and I thank Zukiswa Wanner herself for sending me a copy of her book to review.